The 8th Duke of Wellington has joined leading military historians in a bid to save the farm that was pivotal to British victory at the Battle of Waterloo. They are trying to raise �3 million (�2.4m) to save the dilapidated Belgian farmhouse where the 1st Duke of Wellington's men staged a brave defence that swung the famous 1815 battle in favour of the Allied forces. They want to turn the Hougoumont farmhouse near Waterloo into an education centre that will permanently commemorate the battle which helped end Napoleon Bonaparte's imperial ambitions. The group launched "Project Hougoumont" on the 193rd anniversary of the battle. They hope to have raised the funds and restored the farmhouse by June 2015, in time for the 200th anniversary. The project has the support of the Belgian authorities, which own the farmhouse. Military historian Prof Richard Holmes, chairman of the project, said the objective was to save "a fundamental piece of world history" from falling into total disrepair. He said: "In my long experience of historical battlefields, few spots have the haunting appeal of the farm complex of Hougoumont on the field of Waterloo. "In seeking to preserve this iconic spot we do not simply remember the British troops who held it. "We also applaud the courage of the German infantry who fought for the wood in front of it, of the brave Frenchmen who came so close to taking it and turning the fortune of the day, and of the cavalry whose charges swirled up and down the slopes within sight of its ancient walls, now in such acute peril. "This is not a question of national pride or regimental commemoration. It is about saving a fundamental piece of world history, and we simply must not fail." The current Duke of Wellington, who is 94, has given his blessing to the project, as has his son the Marquis of Douro. The small chateau of Hougoumont stood before the extreme right of the Allied position. The Duke of Wellington formed the view that the chateau was the key to his flank and garrisoned it with the light companies of the Coldstream and 3rd Foot Guards under Lieutenant Colonel James MacDonnell of the Coldstream Guards. Nassauers and guardsmen held the woods to the front of the building. The British troops took over the range of buildings on 17th June and spent the night fortifying them, building fire steps and loop holing the walls. All the gates were blocked other than the main gate on the northern side to provide access. At 11am on 18th June Prince Jerome�s division began the battle with his attack on Hougoumont, the French driving the Nassauers out of the woods and attacking the chateau. The French surged around the buildings and rushed the main gate in the face of a rush of British guardsmen headed by Colonel MacDonnell to keep them out. 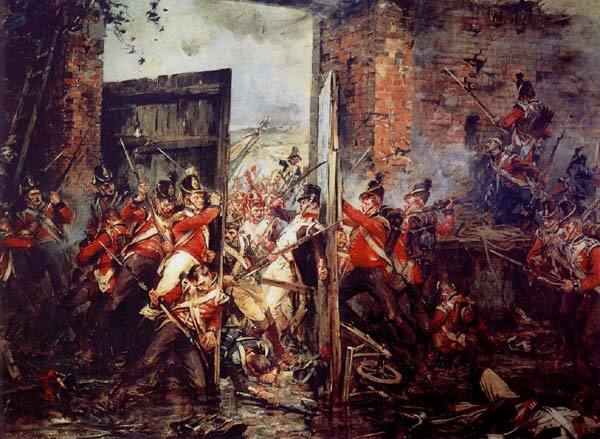 The gate was damaged and there ensued a struggle by the British to shut the gate and by the French to force it open. MacDonnell and his party of officers and sergeants forced the gate shut and Sergeant Graham of the Coldstream put the bar in place. The few French who had penetrated the farm were hunted through the farm buildings. During the rest of the day Hougoumont was subjected to a sustained attack by Jerome�s troops with assistance from a further division. The garrison was reinforced with more companies from the two Foot Guards battalions of Byng�s Guards Brigade, 2nd/2nd and 2nd/3rd Guards. When, during the afternoon the supply of ammunition in the chateau became critically low, Sergeant Fraser of the 3rd Guards returned to the main line and returned with a wagon of cartridges, thereby enabling the defence to continue. By the end of the battle the chateau had been set ablaze by howitzer fire and the buildings were heaped with British casualties. The French were unable to capture Hougoumont and their casualties filled the woods and fields. The two battalions that defended Hougoumont suffered 500 dead and wounded out of strengths of 2,000. Some years later an English clergyman bequeathed �500 to be given to the bravest Briton from the battle. The selection was referred to the Duke of Wellington who nominated Lieutenant Colonel McDonnell of the Coldstream Guards for his defence of Hougoumont. Colonel McDonnell gave half the sum to Sergeant Graham.